Save Time on Back-to-School Hairstyles! School hairstyles just made easier! In the next few weeks, families everywhere start organizing their calendars around the customary necessities and rituals of getting back-to-school. Here is a new revolutionary service that can save you precious time on squeezing in those hairstyles for school. Great Clips, Inc. has just introduced their new Online Check-In service. The new service allows you to add your name to the wait list at any Great Clips salon from your computer or iPhone. Although Great Clips has always worked off the principle of low wait times, this gives the customer more control in managing their busy schedules. What a great idea this is for everyone! If you’re busy out and about getting back-to-school supplies and clothes for the kids but also want to squeeze in haircuts, just log in to greatclips.com to see where and when the most convenient timing is for you. Your information is immediately put into the salon’s computer register and your name will appear on the wait list. Customers are taken in the order they were added to the list, whether they check in remotely or in person. With back-to-school haircuts starting to fill salon chairs everywhere, you may find waiting periods longer, especially at family orientated salons like Great Clips. This innovative step by Great Clips seems especially timely for all to get familiar with using their new technology. And this service is sure to be helpful for not just the back-to-school group, but for anyone who wants to have more control on how long they wait for a haircut. The new Online Check-In service is available at Great Clips’ 3,000 salons across the United States and Canada, including free iPhone and Android apps. Thanks Great Clips!! August 10, 2011 By: Barb Quinn Leave your comments (0), Your input matters. Back to School Hairstyles- Keep it Simple! The transition from summer beachy hairstyles to back to school hairstyles doesn’t need to be anything major or complicated. The most important thing you can do to have great looking hair going back to school is to give your hair a little extra TLC. A few deep conditioning hair treatments and a great haircut for your hair type are a couple of things that will go a long way in healthy, shiny hair is its healthiest and shiniest shape. After that, keep it simple and your back to school hairstyle will be fabulous! Back to school hairstyles should be healthy! Since summer has its ways of fading, drying out and damaging your hair, now is the time to spend a little more effort getting your hair back to health. It will pay off to take a little bit of time to do these things for the health of your hair. If you swim in salt water or a pool you should use a clarifying shampoo and moisturize your hair to get it healthy, shiny, and more vibrant. Great looking back to school hairstyles start with healthy hair! When hair is dull, dry and damaged looking, no matter how much time you try camouflaging it by styling it, you still have dull, dry damaged looking hair. Here’s a routine that will get your hair in its best shape possible for whatever back to school hairstyles you choose to wear! Use a clarifying shampoo once or twice a week if needed, to rid your hair of product buildup. Use a deep hair conditioning treatment once a week, after clarifying your hair. (Joico K-Pak Deep-Penetrating Reconstructor was voted best deep conditioner at hairdressers Choice Awards). Use a shower cap or saran wrap and towel to generate heat, leave it in your hair for at least 20 minutes in order to penetrate the hair shaft more deeply. A hair dryer is a great way to deliver heat when doing a deep conditioning treatment. Back to school hairstyles should work with your hair type! Keep it simple – Your back to school hairstyle should not be a style that requires a lot of work before going out the door. Instead, the hairstyle you wear should work with your hair type and not against it. Getting a hairstyle that works with the natural grain of your hair will give you more easy styling options. Unless you are very talented with styling your hair, a big hairstyle change may mean significantly more time spent upfront in your styling routine each morning. Who needs this kind of stress when you’re pressed for time? Consider saving the new hairstyle change until after you are into your new back to school routine. If you want to make a hairstyle change, remember less-is-more. A small change like wearing bangs or no bangs can make a huge difference in your look without a lot of fuss. Learn 3 different ways to style your back to school hairstyle – By spending just a little time up front learning a couple new hair styling techniques, you can give your hair a break, save yourself time every day and get a reputation as being fashionista too! You will probably have a favorite way of hair styling, but by changing it around a bit, it won’t get old and tired looking. At every haircut appointment be sure to ask your hairdresser to show you a new way of styling your hair. Make sure to make note of the styling hair care product recommendations at the same time. If you would rather buy over-the-counter hair products, just stay with the same type of product your hairdresser recommended i.e. ; mouse, gel, oil, straightening serum etc. Learn how to use one new hair styling tool. Try a flat iron, different size curling iron, velcro rollers, hot rollers, rag rollers, bendy rollers, pin curls, roller brush iron, hair dryer, and diffuser. Learn to style with a hair care product only and give your hair a break. Try one of these, gel, spray gel, mousse, pomade, serum, curl enhancer, shine product, smoothing product, styling cream, root lifter, sculpting lotion, thermal spray, and volumizer. Learn a new updo. If your hair is long enough, learn one new way to get a classic, casual, contemporary or elegant look. It will change your look totally and quickly. A good hairdresser will be happy to help you out here. Your hair doesn’t need to be as long as you may think to do some chic updo or half updo hairstyles. Learn to braid. Braids once again have made a big comeback! Allow yourself a little practice time to learn a new braid, it will give your hair a break and give you some unique looks of your own. Classes are given at my local Community Education; check it out in your area. The library is another source for learning how to do new braids! Or, just invite over one or two of your friends that have the knack! 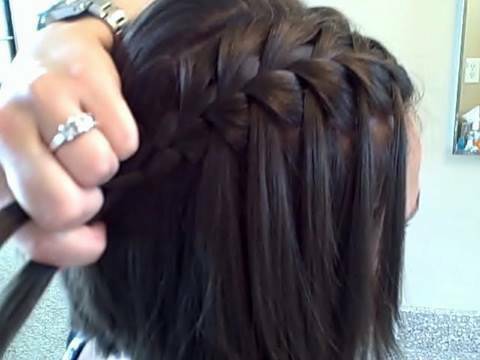 The Waterfall braid . . . . Love this look! August 18, 2010 By: Barb Quinn Hairstyle Blog Leave your comments (1), Your input matters.